This is not my quilt but I wish it was. Jan over at Bemused kindly gave me permission to show these photos from her 2012 Tokyo quilt festival photos Thanks Jan. You can click on these for larger views. I'm fascinated by the block and also the setting which is very clever. At first glance, I see the colours and the circles then I see the grid that's been overlaid on the blocks. Upon closer inspection, this has even more layers, check out the light value of the half blocks surrounding the outer edges of the quilt that serve as a border but tie in with the main blocks. Look even more closely and there is a square on point right in the center to bring the eye back . They were achieved by the effective use of value and in the four outer points, light values were used in a quarter of the circle. Here it is again. Now take another look, (you may have to click on the photo) and see if you can pick that there is yet another element not so obvious. On the two diagonals of the quilt, another quarter of each block has a different colour arrangement in the corners. This time they are as a square as opposed to a triangular section. Clever I tell you! Even the sashing isn't just a straight strip. The block is easy to draft so I had a go at playing with the pattern. Only the block in the bottom left of the photo is accurate, the others were a failure because of the troubles that dividing the block and doing the white sashing gave me. You can see the different shape of the sashing in two corners. The Japanese quilter appliqued the blocks and I suspect that they were done in quarter sections. Even the sashings were appliqued. I did mine mostly by machine with the smallest amount of applique at the very end. It took a lot of trial and error but I finally worked it all out and what a satisfying exercise that was. If there was enough interest, I could do a run down of my process. I may or not do the quilt but it was fun testing it out. Remember my Candied Hexagon quilt? I hand pieced all the blocks in this quilt from a pattern in a magazine that's no longer available. The pattern was not accurately printed in the magazine but I had no problems until it came to the border. I got there with a bit of fudging but it reminded me of something very important. Always do a test block from any pattern before committing to cutting for a whole quilt. Some magazines have testers that test blocks but they rely on the printers to get it right so don't assume they got it right. 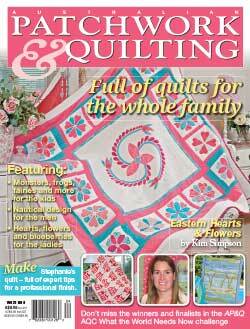 Unfortunately, Australian quilting magazines have a reputation for having many patterns that are printed incorrectly. The same goes for books. I like to check on google for any errata for books I may have purchased. The first printing of Freddy Moran's houses book had every single template wrong and the correct ones were made available via a download on the Internet. I have a piece O' Cake book, Applique Delights that had the same issue. 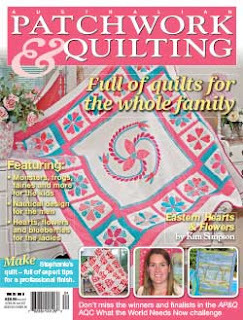 If you are thinking of making Linda's red and white school house quilt from this magazine, please go visit her blog, Quilts in the Barn for some important pattern corrections. In fact go and visit anyway, she has written this great blog post about that experience. That first quilt is amazing! So interesting on so many levels! And your candied hexagons has long been a favourite of mine! Stunning! So much good information in one post! Thank you for sharing the up close pics of your friend's block. Wonderful quilt! And I had no idea that so many books contained errors. I just assumed that before print they had been tested and retested first. 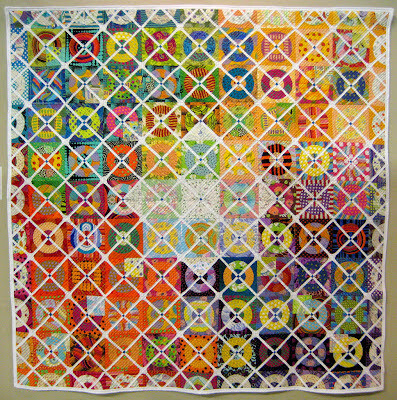 Your Candied Hexagons is one of my all time favorite quilts I've ever seen. That’s amazing Janet! Love that quilt and isn’t it the best part of quilting to figure out how something is constructed? Working out how-to blocks is a process I take great delight in...I love the way you talked us through that totally wonderful Japanese quilt. There seems to be a fascinating culture of simple complexity in Japanese quiltmaking which is quite seductive!! Surely you're tempted to make yourself a version? Adore your Candied Hexagons - those big boofy flowers are fabuloso! what a good posting. 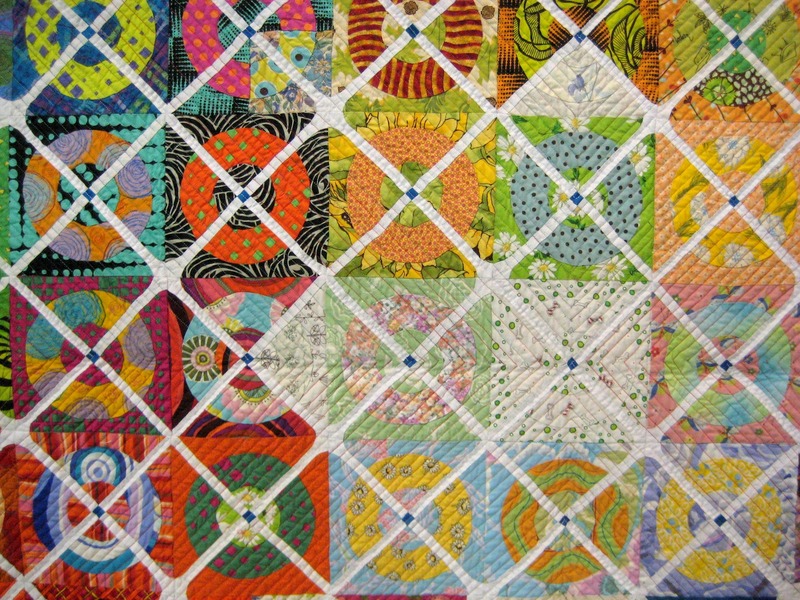 The Japanese quilt is amazing, as is your working out the block. Love your candied hexagons, looks just like the original. I am still working on a version in soft pinks and yellows. I wanted to use my Kaffes, but the stash took over. And we can all be forewarned about magazine patterns, was very worrying for Linda, i wonder if the mag is printed "offshore"
Excellent advice....I've certainly been caught out with patterns from books/magazines before. I just adore your Candied Hexagons quilt. I've long been amazed by Japanese quilts. This one is no exception especially since it's made with bright colours, contrary to the usual muted ones they usually prefer. And of course I love your Candied Hexagons, not least since Kerry is a dear friend of mine. We've met many years ago in Taiwan where we belonged to the same quilt guild and have been keeping in touch ever since. Good advise about about making a test block. love those quilts. I have had trouble now and then with blocks that have been printed in magazines or books wrong and sometimes realized it pretty quickly and other times not until I was just about done! I hate it when that happens. Thank you for sharing this post. It's always scary creating and writing a pattern then publishing it, even though I have amazing pattern testers. In the end the error would be my fault. However a publisher printing errors is a whole other nightmare. It it very much appreciated when an error is brought to my attention (only one so far) in a kind manner. We are humans and humans make mistakes. It is the designers responsibility to correct those mistakes because we really just want people to enjoy our patterns and have a positive experience. I always suggest make one test block first before cutting up all of your fabric! It is fun to work out the details of a quilt when you don't have the instructions. Like decoding a secret language. Love the Japanese quilt. I am always amazed at the amount of thought and planning that goes into a quilt like this. Errors can be frustrating and it is always good to test out, as you said. It is painful to cut out all the pieces only to find out they are all the wrong size. Great post in all levels. 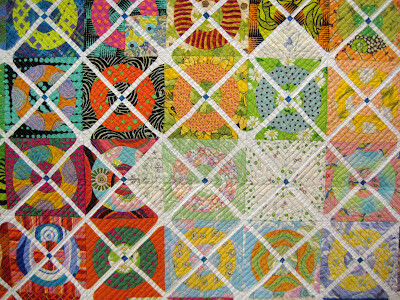 Your quilt is gorgeous as always is, the Japanese quilt is incredible. I would love to see how you made it. (question: what is the block size?). I always test one block before I start on a quilt. I have had the same experience; and I had to add "coping" strips to blocks to make them fit. Great idea to look for erratas of patterns. thank you. what a great post and interesting about the typos! What a fantastic quilt on all levels!! Some quilts just have so much going on that a deeper look is in order. Thanks!! 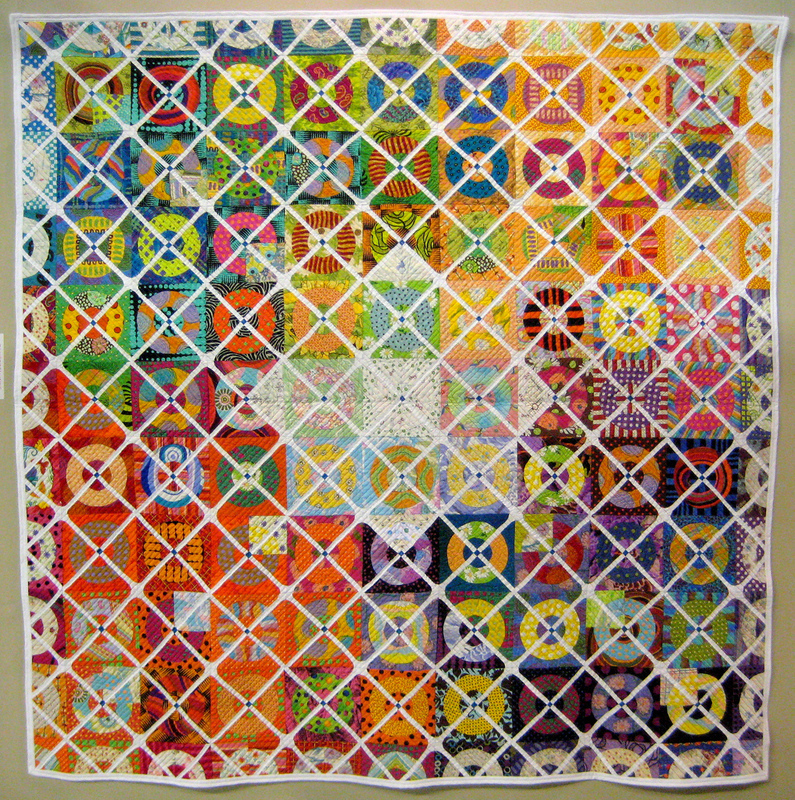 I absolutly love your Candied Hexagon quilt so please do a run down of your process! This quilt has followed me in my mind since the first time a saw it and I´ve been thinking a lot of making it. I´m always so impressed by your work. This is a great post, Janet. I sometimes wonder if many of today's quilters look at quilts this way (seeing the subtle layers you pointed out in this quilt) especially when I hear MQ Bloggers say they have never been to a quilt show. WHAT?!?! How can you be a good quilter (insert any other kind of craft or work) without studying the work of others outstanding in the field? And many quilters I know wouldn't dream of redrafting something themselves. For what it's worth I think a post about your process would be very worthwhile. Amazing quilts here Janet. I love Japanese quilts. They tend to make you slow down and smell the stitches. SO much thoughts and work goes into each quilt and has the definite mark of the maker. I have never seen one from up close but the pictures are always worth a thousand words. I have been collecting magazines and books that have Japanese quilts and Jan's blog and flickr site have been my favorite place to see the show quilts. What an amazing quilt!!! Thanks for sharing...and the advice about test blocks! I rarely follow patterns but when I do I check every measurement before starting as I'd hate to get partway through and discover a mistake. I hadn't thought about googling for errata though, I'll remember that tip! Have you tried to add a sliver of white onto the triangle corner befor the sashing (to eliminate the shaped edge of that white smashing). Basically there would be a blue cornerstone, and a white(slightly larger) cornerstone made from the added slivers. I did a project for a well known magazine and they messed it up really badly. Some of the templates were missed out and some were printed the wrong size. I dont know how as they received them from me on graph paper. Very bad experience as you feel responsible and then have to help hundreds of people. Wow! Lots of design details in that quilt and that sashing looks tricky. Your blocks look great. The best advice that I was given when I first took up patchwork and my teacher said to pay attention to a quilt and really study how it is made up and I can honestly say that I can draft any block because of that. I love to draw my own blocks. I only have myself to blame if they are wrong. The quilt you showed looks stunning. I would love to make that one. Hope you do have a go as I know it will be as stunning. The quilt you have shown is wonderful!! It's fun playing "pick the block". I bought Freddy's House book recently, thanks for the heads up about checking the templates, Fancy getting every template wrong!! I read Linda's post, hers and your post are great reminders to do a sample block first. I forgot to say I love your Candied Hexagons.. I've been sewing pieced hexagons recently so it's great to see your!! This is a great post. I would be very interested to read a rundown of your process. I just love your blog and Mr Quiltsalott. My Mr was laughing. I want to thank you from a long time appliquer for the tip about clipping your circles at the starting point. I had never heard of that before and it truly changed my love for circle applique. You are just too amazing!!!! Just spending some time over coffee breathing in inspiration for my next hand-piecing project. I really like candied hexagons. Now that the Carpenters Wheel quilt is done I'm wondering where to for here? It's those in between projects times that make me drift. Drift for here to there and everywhere. Get my drift? Hee. Appreciating you, *karendianne.